The Dow Jones Industrial Average, the DJIA for short, is one of the oldest and most popular stock indexes in the United States. According to Masterforex-V Wiki, the index plays the role of an unbiased indicator of the entire American economy by scanning the averaged figures for America's 30 biggest corporations(Coca-Cola Co., Apple Inc., Boeing Co., The Goldman Sachs Group, American Express Co., and so much more). If the index is growing, this means that the economy is growing as well. If the index is going down, this means economic stagnation, or even a global economic crisis, which is something that happens once every 10-11 years (1987, 1998, 2008). If the tendency persists, the next major crisis is likely to happen this year. Who can benefit from a major economic crisis? There is no denying the fact that a major economic crisis is a disaster for the global economy and most of its players... apart from those who trade and invest in forex, stock, commodities, those who can benefit from both buying and selling assets. The salt for the current situation is considered to be the calculations made by anti-globalist traders. According to Elliot's wave theory, the last wave, or wave 5, of the long-term bullish trend (several decades long), is coming to an end - there is sub-wave 5 currently developing inside the mentioned wave of the bullish cycle. Will this happen or not? Time will tell. However, even the most conservantive economists out there are inclined to think that the possible 2019-2020 crisis is inevitable and it's time... to make money in financial markets. 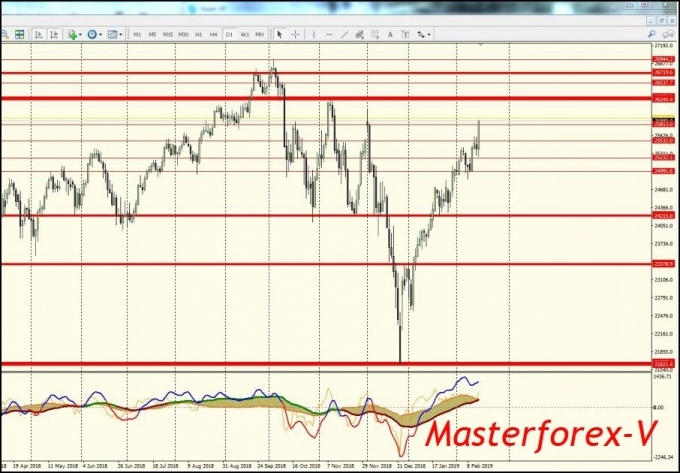 Which broker is recommended by Masterforex-V Academy to trade stock indexes? UK's 26 biggest stocks, including Barclays, RollsRoyce, Vodafone etc. France's 15 biggest stocks, including L'Oreal, AirFrance, Peugeot etc. Germany's 15 biggest stocks, including BMW AG, Adidas, Siemens AG etc. As for the drawbacks of trading the CFD on Dow Jones, there is onely one drawback - negative swaps - 0.3$-0.8$ a day per each 0.01 lots of your positions extended overnight. Crisis Delayed. Dow Jones Industrial Average Still Rallies. According to Masterforex-V, on February 15th, 2019, Dow Jones-30 was still showing signs of strength within the scope of a rally that followed the crash in December 2018. As we can see on the H4 chart, the index has already broken above the cluster of orders around 25813 and is now moving closer to 26245, which is the next strong level of resistance. The NYSE trading day closed at 25860.